For patients looking for a better, more comfortable way to wear a denture, the implant supported Over Denture establishes significant denture stability and retention by snapping the removable denture onto at least two dental implants. An “implant attachment” on the top of the implant is used to create a snapping mechanism, which is strong enough to keep the denture in position during chewing. It also allows for a relatively easy removal of the denture for daily cleaning and maintenance. The Over Denture attachments keep the denture from pressing down too hard on the gum line, allowing an Over Denture wearer to bite on harder foods without the typical discomfort a traditional denture wearer experiences when biting down hard. Most implant Over-Denture wearers report significant improvement the level of comfort and function that an Over-Denture provides versus a traditional lower denture. A severe gag reflex can cause serious issues for patients wearing an upper denture. Since the fit of an upper denture is derived from the “suction” effect on the palate, coverage of the palate is a requirement for a good fit. When a patient has a gag reflex, it is impossible to extend the denture appropriately. In this situation, an implant over denture can be a significant advantage and a comfortable remedy. With the retention of the denture coming from the snap mechanism of the implant attachments, the palate does not need to be fully covered, and thereby minimizes a patient’s gag reflex. 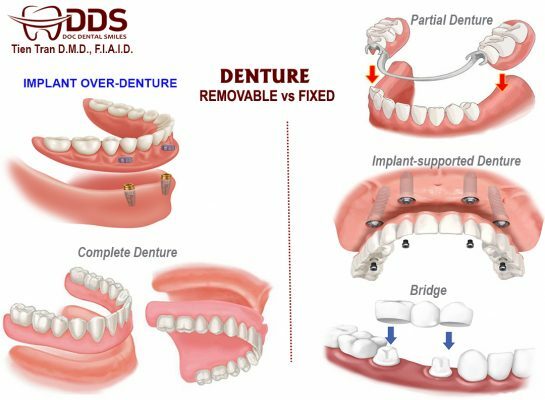 Implant-supported Over Dentures can be less than ideal for a patient depending on treatment objectives. When the denture is still removable and it sits on the gum line, functionality is not what one would expect from dental implant treatment. Compared to a typical denture, Over-Denture function is an improvement, but significantly less than the functionality of one’s natural teeth. Research indicates that a denture wearer’s function is only at 20% of full function. 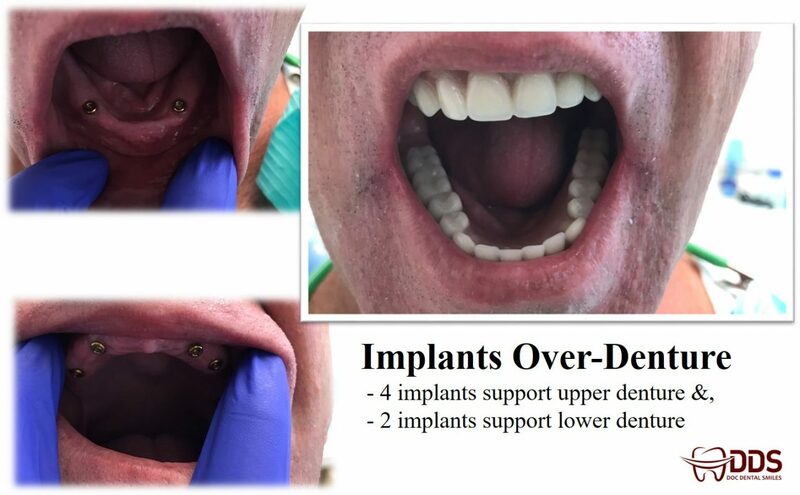 Over Dentures can improve that percentage to 40 to 50% of normal biting force, but this still is well below what many people would expect from permanent tooth replacement using dental implants. Over time, maintenance is required with any implant supported Over Denture . The most common issue is wear and tear on the attachment. With repeated snapping in and out of the denture prosthesis, the Over Denture attachments eventually wear out over time, resulting in diminished snap retention and perceived looseness of the Over Denture . A typical replacement schedule is every 18 months. This maintenance procedure can be done at a normal cleaning appointment or as needed. There is a cost associated with replacement of the attachment parts, much like any regular maintenance. In addition, any denture that is supported on gum tissue will also incur change as it relates to quality of the fit, as the gum line may reduce or resorb. An implant Over Denture will require occasional re-fitting as time goes on. One should expect to reline an Implant Over Denture every three to five years to maintain optimal fit. Patients looking for a cost-effective way to avoid the challenges of wearing a denture should consider the an Implant Over Denture from DocDental Smiles.